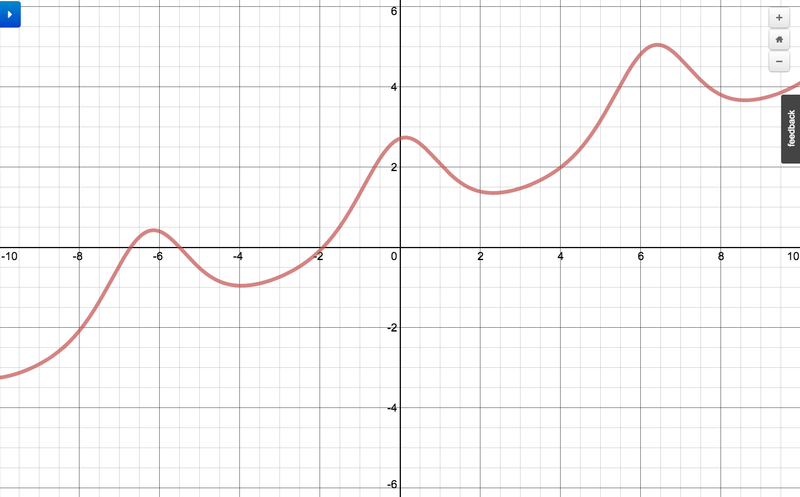 Can you create the following graph using www.desmos.com/calculator (or some other graphing device)? y=1/2x+2cos(x)+1.25 is sort of close. Matching up those constants is tough but I love the challenge. 1. Should we share our attempts by writing the equation in the comments, or by linking to a saved Desmos graph? First way is simpler, second way prevents spoilers. 2. For the advanced challenges, should the author post a hint at some point in the day? 12 pm? 3 pm? 6 pm? Thanks for playing along! I look forward to more contributions from the twitterblogosphere. P.S. A third question for those with more blogging expertise (especially related to comments): Should comments be more open? Or is a required sign-in a good way to fight spam? What are the rules of the games? Are decimals allowed? Eli, we’re still working out the “rules of game.” I’ll add posts in a day or so for “How to Play” and “How to Contribute” to establish what is allowed in terms of functions, operations, parameters, etc. As for a hint for today’s, I have a special place in my heart for exponential functions in general and the natural base in particular. Got it too! And it’s beautiful. Nice one.